It’s summer! (At least for those of us in the northern hemisphere.) 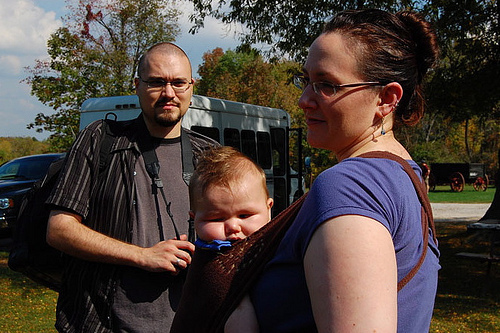 Summer means beating the heat by wearing sandals and short sleeves and sunglasses and … a baby? This article will give you some ideas for how to tie on a baby when you’re already sweating buckets. Mikko, my four-year-old, was born in June, and I currently have a May-born newborn to wear as well, so I know something about summer babies. Granted, we live in Seattle, which is about as temperate as they come, but I hope these tips can help even those of you in the midst of summer-long heat waves. 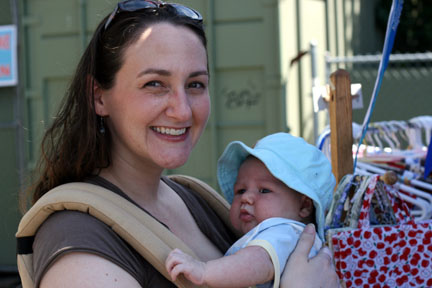 Are you going to get hot if you wear your baby in the summer heat? Well, yes, but you were going to be hot anyway. Will your baby be overheated next to you? In all but the rarest cases, no, if you’re both dressed appropriately (as in, less is more). Parents and caregivers in even the hottest of locations on earth wear their babies, so obviously it’s doable. Will you be more comfortable not wearing your baby? I’m going to suggest no, because you’d be carrying him or her anyway. At least with a sling or wrap, you’ll have your hands free to fan yourself and keep your water bottle at the ready! With the right carrier (this is a mei tai I made), you can keep up with your summer activities — playground fun like baby's first slide! So, first I will give you some general tips, and then I’ll talk specific carriers and positions that are helpful for hot weather. When possible, wear just enough clothing to be comfortable — both wearer and wearee. Dress lightly, both of you. Indoors, our babies live in a diaper and t-shirt, sometimes without the t-shirt, sometimes without the diaper. I live in a camisole and shorts, sometimes minus one or the other. We’ve done some absolute skin-to-skin, but sometimes in the heat, that gets too sticky. I find a light layer of clothing between us is usually the best bet for comfort. If you’re breastfeeding, drink a lot of water. If you have a caring volunteer, assign the task of keeping a cool drink at your side at all times. Make sure your baby stays hydrated. Let her drink to thirst, whether from the breast or bottle. If she’s breastfeeding, your breast milk and your baby’s instincts will adapt to the warm temperatures and the slightly more watery foremilk will provide all the liquid needed. Don’t ever worry about needing to supplement young nursing babies with water or other drinks (particularly under 6 months, but really at any time with an avid nursling). Formula-fed infants might need additional water if dehydrated, but supplement only under a pediatrician’s care, because it can be very dangerous if not done in the proper amounts or with very young babies. Keep moving, or unwrap as needed. I find that I do most of my wearing while walking, which sort of provides its own breeze. When we sit down, I tend to take my baby out of the wrap or sling (neither of my little ones have allowed it any other way, actually — they demand movement), so I get a release of any trapped heat with the unwrapping breaks. For older babies, a back carry might allow you more air circulation. I know I feel more wrapped up if my front is covered than my back. So it’s worthwhile to figure out how to do a back carry and try it out if you and your baby are ready for it. (Some people feel comfortable doing high back carries with newborns, but most prefer to wait till the baby has more head support. I enjoyed front carries up until the distribution of weight up front was uncomfortable for me, at around 30 pounds, and then switched to back carries.) Here’s a mei tai version of a back carry; here’s a back carry for a ring sling; and here’s a rucksack carry for a wrap, which puts only one layer of fabric over your baby and doesn’t put as much fabric over your chest in front. Protect tender skin from the sun. Putting a wrap over your baby will shield some skin, but most cloth does not have a high SPF, and usually parts of your baby will still be peeking out. Try to seek shelter during the sunniest times of day and shield skin with clothing, a hat, and perhaps the tail of a sling, hood of a mei tai, or similar light coverings to shade your little one and prevent excessive exposure (though keep baby’s airways clear). Particularly if your baby is on your back, remember to check his sun-protection levels frequently or ask a trusted spotter to do so. It’s not recommended for young babies to use sunscreens, but older infants and children can do so as long as we remember sunscreens aren’t a substitute for commonsense behavior. The temperature was in the 90s this day on our vacation in Ohio. I am wearing a fleece mei tai and surviving, despite my hate-hate relationship with hot weather. I’ve used several options during warm weather with a newborn: stretchy wraps, woven wraps, ring slings, and two mei tais I’ve made: one from fleece and one a canvas mei tai with intentionally light padding and small dimensions. My favorite choices have been the mei tais, because the amount of fabric touching/encircling the wearer is really limited, and there’s a lot of air flow through the sides. I know fleece and canvas seem like counter-intuitive warm-weather choices, but it’s not a whole lot of fabric. With the fleece, there’s a no-sew option to make your own mei tai easily, so you can cut it as narrow as you’d like to promote breeziness around your babe. 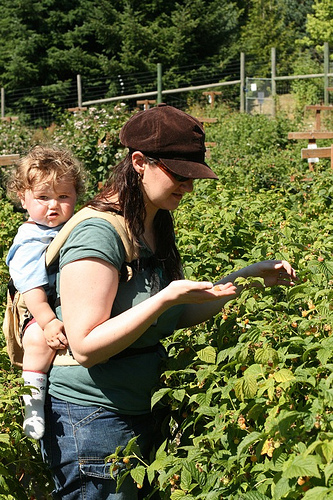 Picking berries in the ERGO. Having an older baby on your back can be more cooling. For older babies, a soft, structured mei tai-type carrier like the ERGO , Beco, BabyHawk, Kozy, Boba, or Freehand, would give heavier babies and toddlers the support they need without adding cloth bulk. As far as wraps go, although we loved our homemade stretchy wrap (similar brand-name stretch wraps are the Moby and Sleepy Wrap, for comparison), the amount of thick fabric isn’t ideal for hot weather. A double-loop wrap like the Baby K’tan (enter our giveaway here!) is sized to fit each babywearer and therefore has less bulk than a typical stretch wrap. Another good option is to go for a lightweight woven wrap, which would be airier than a typical stretch wrap. Good options include making your own out of a strong but see-through cotton gauze or buying a woven wrap that’s known to be a lighter weave, such as the Ellaroo, Vatanai, Didymos Waves, Bali Baby Breeze, or Hoppediz Light. You might try a shorter wrap and/or carries that put only a single layer of fabric over your baby — such as the kangaroo, rucksack, or Tibetan. A ring sling can also work well, particularly if it’s not too bulky and is in a lightweight fabric such as a fine linen or silk. Babies who are able to sit unassisted can be safely worn in a hip carry position, which keeps a minimal amount of fabric touching each of you, and minimizes skin contact as well. A pouch is similar and is even more streamlined since it’s fitted to the wearer. If you can sew, it’s quite possible you could find a sling pattern (e.g., Jan Andrea’s from Sleeping Baby) and some mesh fabric at the store and give it a go. It would be even easier to make the mesh fabric into a wrap style, though be careful not to choose a slippery mesh if you’re trying to keep it knotted. Be sure any mesh or other lightweight fabric you choose is sturdy and doesn’t have too much stretch to it, and if you make a ring sling, you need to order the special reinforced rings (I would choose nylon over metal if you expect to wear it into the water). 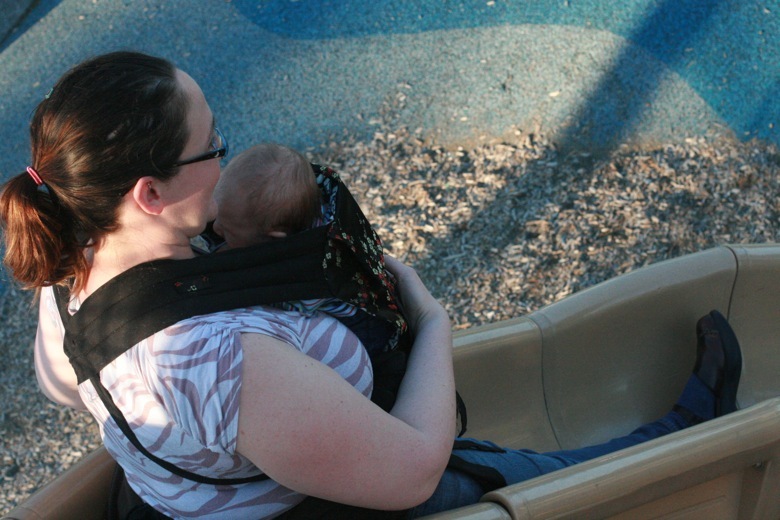 Please use your parenting sense and be sure any homemade sling is safe before using it with a baby. For UV protection, remember that any fabric covering skin is a good start, but fabric alone, particularly mesh fabric, is not going to have a high SPF. If you want or need specific sun protection, look for fabrics like Solarweave. But no matter what type of wrap your baby is in, remember to keep the sun protection tips above in mind. For mesh and sun-protection slings, you can also try to score something WAHM-made or secondhand by checking out eBay and Etsy, as well as consignment shops. Or ask local and online friends in similarly steamy locales for hand-me-downs. With a little babywearing adjustment, you and your babe-in-arms should be able to breeze through the dog days with sunny smiles. What are your hot-weather tips for wearing a baby? What are your experiences with staying comfortable? Disclosure: Baby K’tan is a giveaway sponsor. All other products are the author’s own or were used for illustrative purposes. Amazon, ERGO, and eBay links are affiliate. See our full disclosure policy here. This article has been edited from a previous version published at Hobo Mama. Great article! The heat and humidity here have been ridiculous and I admit that it has made me think twice about wearing my son. One trick we use is to keep a handkerchief with his all of his “gear.” A handkerchief has about a million uses, but on hot days we dip it in cool water and drape it around our necks and pressure points to cool us both down. Oo, I like it. Pressure points definitely make for good instant relief. I had a friend who swore by the maxim of always having a handkerchief handy! I think you have it all covered! I carried all 3 of ours in all weather and never really thought too much about it, though we do not get real extremes of weather. A really useful article with some great tips, thanks! Though not an original idea of mine, I can’t remember who to credit; placing an ice pack wrapped in a towel between you and the babe, either on back or front. It has been VERY helpful for us. LOVE this article. Last week we went to the farmers market and it was 95+ degrees. As it is everyday here. We were both so hot in the Ergo by the end of it. I’m going to try the back carry and my sling this next time. I’ve definitely found our Ergo too hot in Texas (25 days over 100 and counting! ), but the mesh Zolowear sling works for short bits in a hip carry. Those are the only two we’re using with our toddler, who thankfully started walking recently. This is a major challenge in this part of the world! I have a new May baby myself. While my Ergo is my go to carrier that I’ve used for three years with my toddler, she isn’t quite ready for it yet…I invested in a mesh sling this year for the pool and it’s been a godsend! I’m not spending time out of the pool with her, and it gets her cooled off too!! Very good point! My firstborn was very heavy, so I can see the mesh wouldn’t have long been supportive for us out of water, either. Thanks for the alternative suggestions for other toddler-wearers! I was curious about that one as well! You’ll have to let me know how it works in action. I’ve tried one back carry in a wrap so far with Alrik (trying to get some things done around the house) but was kind of nervous about it at this age. I live in Phoenix and had a July baby two years ago. That is some crazy heat. For the first four months I wore my little guy in a Portable Baby Wrap almost continuously and it was perfect, very lightweight and folds down to nothing so you can stuff it in a purse when you’re not wearing it. I got a lot of use out of it for baby’s first year, then we graduated up to the hotsling for short trips and the Beco Butterfly for any extended carrying. I live in Taipei, Taiwan (temps in the summer run in the 30s Centigrade (so roughly in the 90s Fahrenheit) with 90% + humidity. I loved the Portable Baby Wrap when my son was younger – very lightweight and cool. Now that he’s older, we use the Boba organic. I also have the Pikkolo by Catbird Baby, which is very versatile but the fabric is thicker than the Boba. I totally second the t-shirt or less. For some reason, I’ve always preferred Spencer in clothes, but it has gotten so hot lately we’ve all turned into nudists! Aside from a bit of sweat between us, I don’t feel overheated from wearing him, thankfully! Also, I wore Spencer once with not diaper. He is MUCH shorter in that thing without one! I usually put his diaper back on just to wear him. Hi there! I used an ergo with baby insert for baby #1, but was considering a wrap for baby #2 (due in Aug). I’m in very hot, humid weather, so I want something I do not have to smother the little one in an insert to use. Did you use a pattern for your homemade mei tais? I’ve never even seen one in person, but I like the idea. A wrap seems really nice, but I don’t think I have the patience for it. Plus, I don’t like the idea of being wrapped like a mummy. Thank-you! I find it the most convenient, easy on-and-off way to wear a baby, personally, and I do think it does pretty well in hot weather. I’ve used it with two newborns, too, and it works well as long as you keep them up high on your chest. Best wishes with your little one on the way! These are great tips! Thank you so much for sharing these! I have more experience with cold babywearing than hot (I’ve been out in the -40os), but we do get some hot days (high 80s, low 90s) each year.